Separation anxiety is a critical behavioral problem, which can cause tremendous emotional distress for both dogs and their owners. It’s not clear why some dogs suffer from anxiety and others don’t, however some research suggest that dogs with a history or abuse or abandonment are more likely to develop separation anxiety. So if you’ve adopted a shelter dog it’s certainly something to keep an eye on. Experts agree that separation anxiety is a panic reaction, and definitely not an attempt by the dog to “spite” their owners. Obviously if you’re away from your dog you won’t be able to spot any of these behaviors. But if you notice destruction in your home, a pattern of urine or feces in the home when you’re away or neighbors or other caregivers notify you about excessive barking while you’re away those are indications that your dog may be suffering from separation anxiety. Separation anxiety is the most common behavior issue suffered by dogs. In fact, it’s estimated that 15-35% of all dogs suffer from separation anxiety at some point in their lives. Here are some more interesting facts about separation anxiety in dogs. Every dog breed is susceptible to separation anxiety because the triggers are based on psychological issues and experiences. But there are some breeds that are more likely to suffer from separation anxiety. Depending on the severity of your dog’s separation anxiety the two most common courses of treatment are medications and/or behavior modification (a fancy word for training). Medications include clomipramine and fluoxetine: These are approved medications for the treatment of separation anxiety that can be prescribed by your veterinarian. Since these medications may take several weeks to achieve effective levels, short-acting drugs such as alprazolam may be prescribed at first. Any anti-anxiety drug prescribed by your veterinarian needs to be given exactly as directed.Aside from behavior modification training and medication, some dog owners have a lot of success with body-wraps that can help your dog self-sooth. 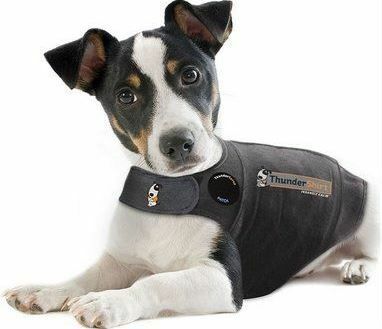 The most popular and trusted such wrap is the ThunderShirt dog anxiety vest, which retails for $39.95. Medication can cost between $20 per month for generic brands and $30-40 per month for name brand meds. If your dog is showing signs of separation anxiety the first step is to discuss the issues with your veterinarian. As previously mentioned, separation anxiety is the most common behavioral issues in dogs and most general practice veterinarians are equipped to treat the issues. There are several great insurance options that will cover treatment for separation anxiety. 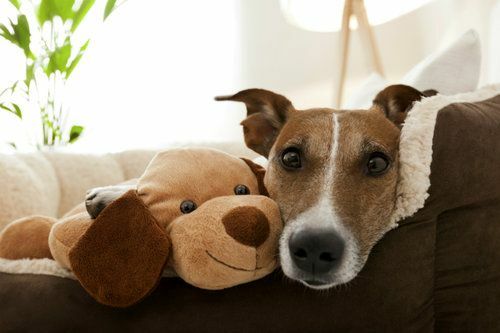 Keep in mind though that pet insurance policies do NOT cover pre-existing conditions so make sure you have coverage before your dog is diagnosed with separation anxiety. Our dog Beau suffered from separation anxiety for years. He was a rescue and never fully recovered from some of the traumatic issues early in his life. The good news is that with the help of anxiety medication he was able to adjust when we were away. No dog owner wants their pet to suffer while they’re gone, so if you suspect your dog has issues with separation anxiety visit your veterinarian and explore ways to manage the problems. It will make for a happier dog and might save you the headache from ripped-up pillows and carpet stains!